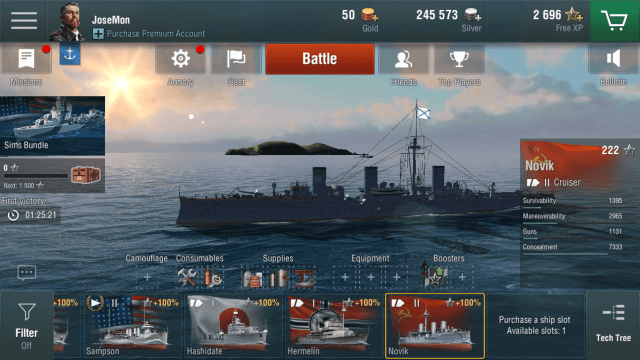 Wargaming’s World of Warships Blitz is the ultimate real-time naval combat game for Android and iOS devices. Unlike World of Tank Blitz, this game is a bit slow-paced, but with proper strategy and teamwork, you can outwit your opponents. Action-packed 7 vs. 7 real-time ship battles can be extremely challenging, so you must be well prepared, choose the best ship and always have weapons and boosters equipped to your ship. If you have just begun playing World of Warships Blitz, then this guide is for you. With the help of these useful tips and strategies, you will be able to score more points, help your team and equip the right items to your ship before setting sail! Mini-map: It is located at the upper-left corner of the screen. Mini-map can be very helpful in spotting enemy warships early on. You can also know which direction your friendly ships are moving. Your mini-map also shows mountains and icebergs. Timer and team line-up: At the top of the screen is battle timer and team lineup. The game ends once the timer hits zero. Green warship icons are your team’s ships whereas orange warship icons are your opponent’s ship lineup. This section also displays your team and your opponent team’s total score. Direction Control: The control pad is located on the lower-left corner of the screen. Tapping the on-screen up arrow button lets you accelerate your ship. Tap once to get your ship moving, and tap twice to increase its speed. Tapping and holding the down arrow button will make your ship move back. Hold the left and right buttons to turn your ship left/right. 1. Damage control kit (fire extinguisher icon), which is used when your ship’s on fire. It suppresses fire and flooding and grants immunity to your ship for a few seconds. It has a cooldown time of 60 seconds. 2. Repair Kit: It restores some HP of your ship in 10 seconds and has a cooldown time of 90 seconds. Use repairs and damage control kits only when needed. You can also equip weapons and supplies to improve your warship’s key stats and boosters to get bonus XP and silver. Scope and Fire buttons: They are located on the lower-right corner of the screen. Tap the binoculars icon to zoom in so that you can spot ships from a fair distance. Zooming in improves your accuracy and doing this will let you spot enemy warships early on. 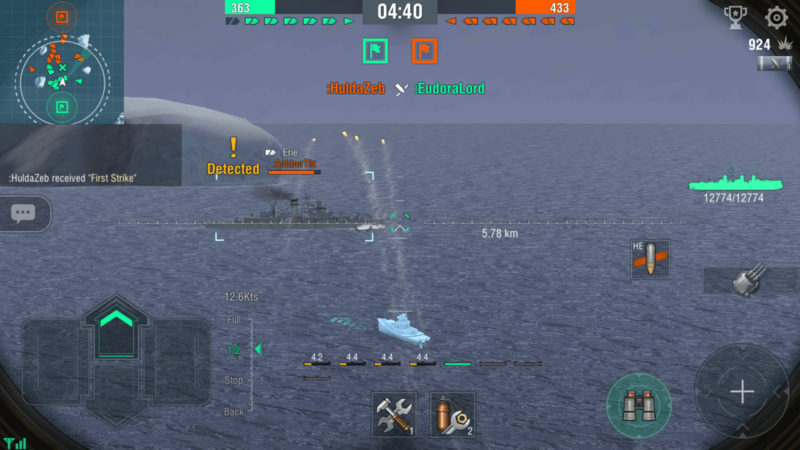 Tap the fire button to attack enemy, but make sure the aiming icon is just above the waterline. With your ship’s side facing the enemy ship, you will get to fire all guns – just double-tap the fire button. Ammo Type and Armaments: Ammo type and armaments are located just above the “Fire” button. The latter lets you switch to secondary weapon, such as a torpedo. Just tap your primary weapon to switch to torpedoes. Experiment with different ammo types to see which one deals maximum damage to enemy ships. Ship HP: The mini ship icon on the right side of the screen shows your ship HP. Green indicates your ship still is in good health, but once changes color to yellow, you should worry about your ship’s HP and consider repairing it using the repair kit. Battling random players from around the world can be tough if you have just started playing World of Warships Blitz. You should practice maneuvering, spotting targets, getting accurate hits and using torpedoes to attack enemy ships. The best place to do this is the “Co-op Battles” game mode. This is where you team-up with other players to battle AI ships. Co-op mode is fairly easy to play. It’s the best playground to get some serious training before playing the PvP mode. Preparing yourself for the ultimate ship battle is not too difficult. You just have to equip the right weapon, supplies and boosters to make sure you have a winning edge over your opponents in PvP battles. Equipping your ship with supplies such as “maintenance packs”, “improved crew rations” and “refined diesel” improves your warship’s Hitpoints, decreases your battery (main guns) reload time/torpedo reload time and improves ship speed respectively. Equipping your ship with weaponry also improves stats, such as decrease in battery reload time, torpedo tube speed etc. Don’t forget to include boosters. They can help you rake in more XP and silver upon winning a match. Always use silver booster and XP booster before battle. Supplies and Boosters are activated automatically when battle begins. You can get them by logging in daily (See the daily login section to know what rewards you will be receiving each day). You can also get boosters by completing daily missions. Just tap the “missions” button on the upper-left corner of the screen. You can use silver to buy supplies, consumables, weaponry and boosters. It’s easy to earn silver. Beat the Co-Op battle mode to get silver. Login daily to get “Beginner rewards” – you will receive lots of silver and XP. Before we discuss what’s “Elite Ship Bonus” let’s find out how to upgrade a warship. You will need blueprints to upgrade main guns, hull and other parts of your ship. Win battles to get them. You can also get them by completing “Career Missions” under “Missions”. Completing tasks such as getting promoted to a certain level or purchasing a tier iii ship or higher will let you finish career missions. When you have the required blueprints of a particular ship component, you can start upgrading your ships. It’s better if you have more number of blueprints of the same type as it will help you max out upgrading a particular component faster. You will have to upgrade particular component a few number of times to max it out. Once you have maxed out upgrading all components of a ship, you will be given an opportunity to choose one of three elite ship bonuses. 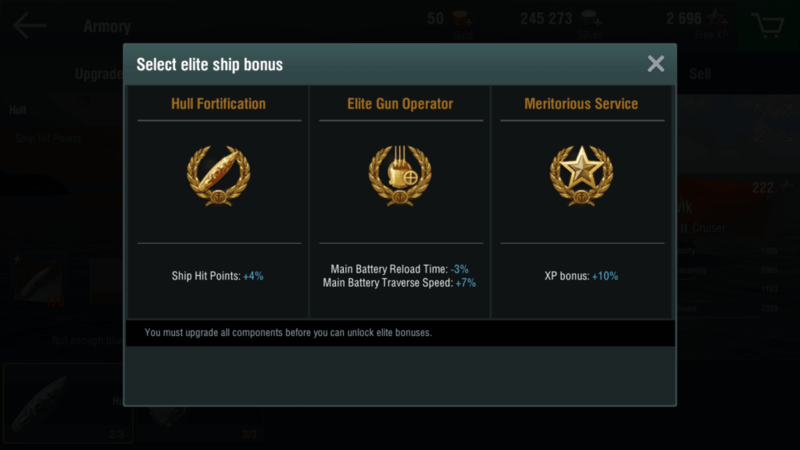 These bonuses could be an increase in ship HP, decrease in main guns reload time, XP/silver bonus etc. Choose a bonus carefully as you can select it for the first time free. You could be one if your ship stays still. Once you have set sail, keep moving. Your opponents can easily spot your ship, thanks to the zoom option, so try to out-maneuver them by moving forward with your ship’s bow facing your opponents or by hiding behind an iceberg and other obstacles and then moving away from their range. If you have just started playing, then stick to your team and move at a slower pace. Tap the “Up” arrow button once to move slowly. Double-tapping will increase ship speed. Try to follow other ships actions. Also, learn from your enemies. Once my ship received maximum damage because a group of warships of my enemy’s team went all guns blazing with their sides facing my ship. It was surely a team effort and they were successful in destroying my ship. My mistake: I was out on my own and was not together with my team. Tap the binoculars icon to zoom in. With zoom, you can spot a ship early on in battle and start attacking it if it is within your range. You and your team should launch the first attack and zooming in button will help you achieve this. You can also find out enemy ship position with the help of the mini-map, but the zoom option is used solely to attack an unsuspecting enemy. If enemy ships are near you, then it’s futile using zoom. Also, when you zoom in to a ship, you can’t see other ships, especially those that silently move in a different direction and set targets. With the zoom option turned on, keep an eye on the map at the upper left corner of battle screen to spot such ships. You might want to expand your ship collection and include better ships to win matches. Researching high tier vessels is the best way to get the best warships. 1. Co-Op battle is the best and the easiest game mode to get XP and Silver. Play more and more Co-Op battles with your team and win them to get rewards faster. 2. Increase the amount battle rewards, such as XP and silver by equipping Combat XP Booster and Silver Booster to your vessel. You can get them by completing Challenges. You can also get them as Daily login rewards. Completing Daily and Career Missions is another way to collect lots of boosters. All these can be found under “Missions”. 3. You can collect lots of free XP if you play the game every day. Just tap “Daily Login” to find out when you will be receiving them, so don’t skip a day if you want them on time. 4. Logging in daily also grants “Beginner Rewards”. Under this, you will be getting plenty of Silver and Free XP. So mentally note the days you will be receiving them and then play the game daily to get them. 5. You can sell your old warship once you have researched and purchased a high tier ship. 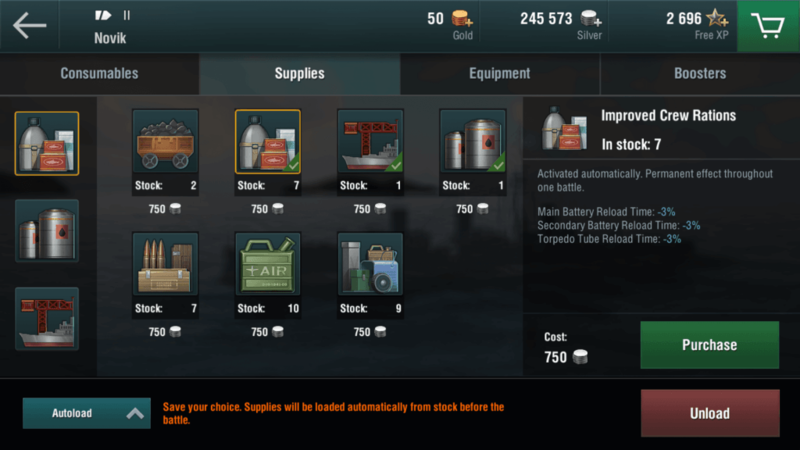 Please note that not all ships can be sold for silver. There is higher chance of receiving silver if you max out upgrades for all modules of a ship. To get rid of your old ship, tap it and then tap the gear button (armory). Tap the “Sell” tab.